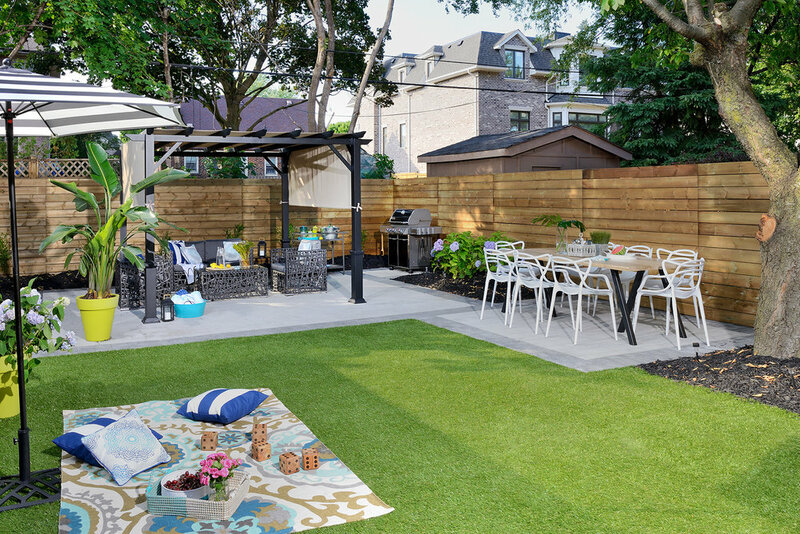 Approach your backyard in a similar way to how you design interiors- with strategic and practical solutions customized to your family's unique values and lifestyle. 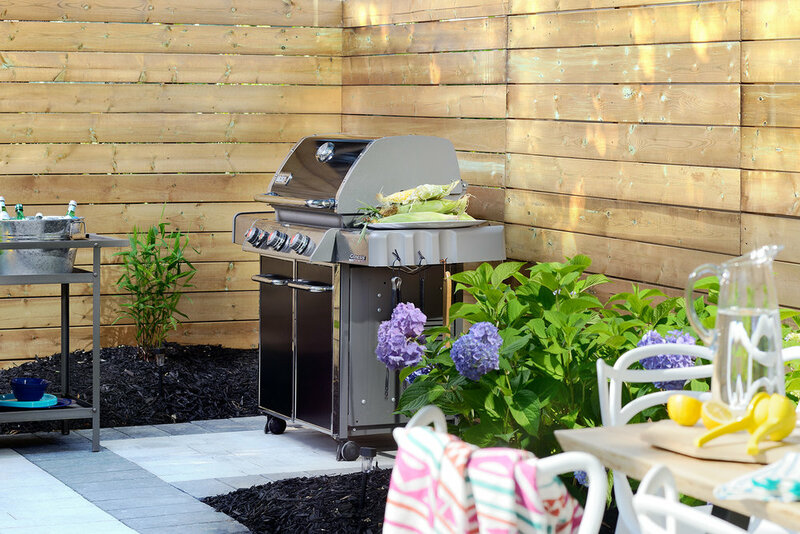 Here are some really important questions to consider when planning an outdoor renovation. Very similar to planning any interior space, think about the "zones" or activities you want in your backyard. For example, do you want a place for lounging, eating, kids to do crafts, kids to play sports, space to prep meals, a pool, etc? Figure out your priorities and then divide your space accordingly. Use black pavers to delineate the areas in a border with light grey pavers for contrast. When we meet with people for design consultations we ask what their budget is, I often get blank stares. But when I press them and ask if they have $50,000 for example to spend, it often reveals a concrete budget number. Set an actual budget- because unlike interior design, I would say there is less variety in cost of materials in outdoor goods. 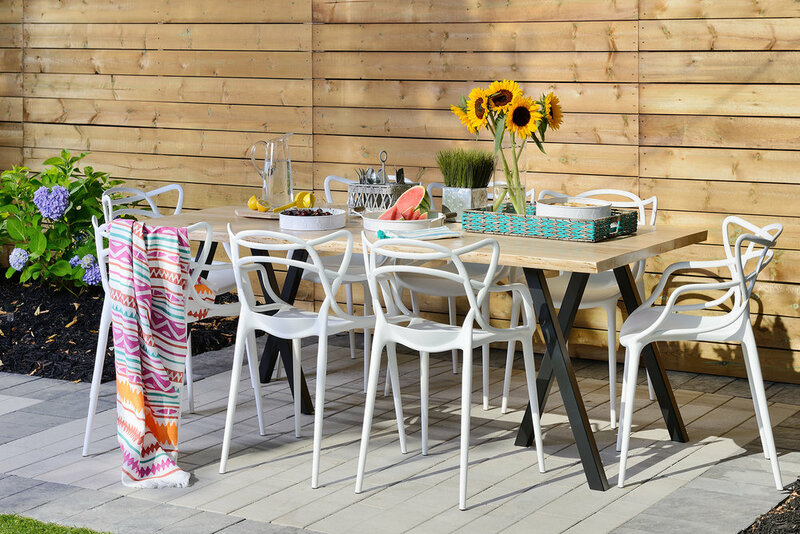 Meaning, with a chair for example, you can search long and hard and find something you like that also might fit your desired budget. For outdoor materials, I would say you are simply more limited. So one must be even more strategic in spending their budget wisely. Bottom line, whether your budget is $10k or $100k, actually set a budget because it will really determine the kinds of materials you can use and the professional services you can work with. Whether you love to garden or don't know your weeds from your flowers, pick materials that will serve your family best. If you wanted the space to read very minimal- keep all the materials very neutral and cooler in tone. And then with accessories you can stay with a palette of navy, teal and lime green, in keeping with some of the textiles and fun dish ware. The pop of colour against an otherwise neutral background is pop and youthful. Ensure you repeat a colour multiple times for the most cohesive look. The final thing to consider to really look like a pro is technology. 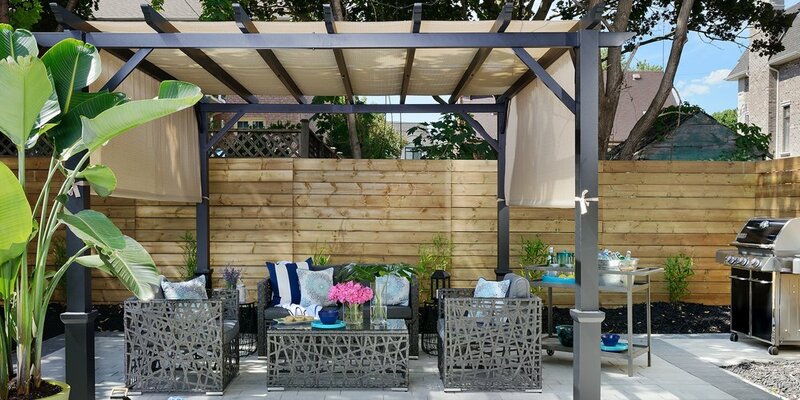 There are so many options for integrating sound into your backyard- but don't let sound be the only thing you consider. Consider bringing in wifi to make the space your outdoor office, a projector to turn any evening into a movie night, and where space allows a television integrated into a built in covered unit for real wow-factor. And regardless, make sure you run power back there so you can plug in an outdoor air cooler- cause how awesome is that for your guests!